Healthy eating has become so complicated that it can be hard to know what to do for the best. Do you eat more fat, less carbs or more carbs and less fat? Are three meals a day best, or maybe snacking is the way to go? Do you count calories, points or ‘sins’, or maybe don’t eat at all and survive on powdered supplements and a whiff of deprived misery? It’s so confusing, it’s enough to make you reach for the nearest doughnut to even start thinking about it. Fruit is packed full of wonderful vitamins, nutrients and fibre, but if you only consume the juice, you miss out on most of these. An average portion of orange juice contains the equivalent of 5 oranges – could you eat 5 of those in one go? That’s more than a few peas on the side of your plate! If you find veg uninspiring, add them to your main meal – into a curry, pasta sauce or stew. In fact, if you add in more veg you don’t need as much meat which will save you money too! If your idea of salad is a few limp lettuce leaves and an under-ripe tomato, think again! Most veggies can go into a salad, so get creative, combine your favourites and see what you come up with. Avoid creamy, fat laden dressings though – sometimes a squeeze of lemon juice and sprinkle of herbs is all you need. This is a brilliant way of increasing the number of veggies you consume whilst filling up on nourishing comfort food. Fling in some lentils or beans and it will keep you going for hours. Homemade is best, but if you buy it, keep an eye on the salt content and additives. Colourful fruits and veggies contain a wide variety of tiny phytonutrients that help us stay healthy. 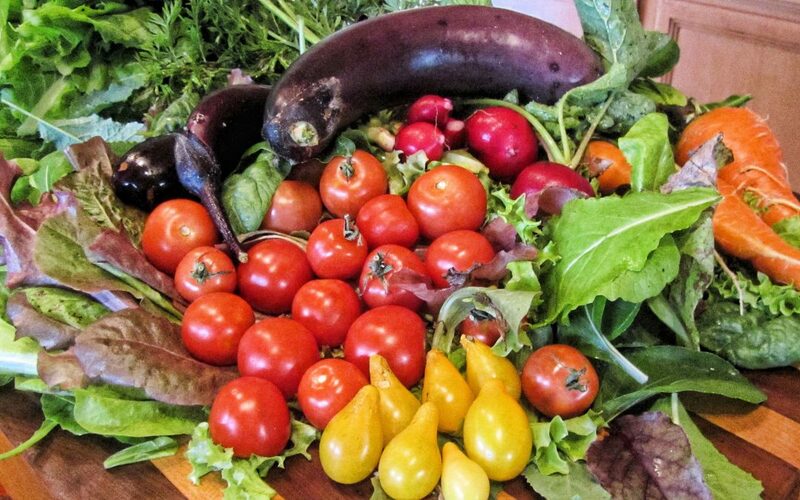 Try to eat something red, yellow and green every day, and look out for purple and blue too.